Our school has been implementing a program called i-Ready® Diagnostic & Instruction that provides our students with an innovative diagnostic assessment and engaging instruction. The focus of this online program is reading and math. 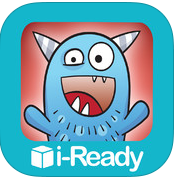 i-Ready Diagnostic & Instruction begins by giving students an adaptive assessment in reading or math. An adaptive assessment is a test that automatically adjusts the difficulty of the questions according to each student’s performance in order to determine his or her abilities in reading or math. Before your child begins the assessment, it’s important to set appropriate expectations. i-Ready is a very different kind of test that presents students with questions that can be both too easy and too hard. It is designed to do this until the assessment finds exactly the level at which the student is performing. Therefore, your child will certainly see some items above his or her level. Encourage your child to independently complete the test to the best of his or her ability, and know that it is okay to get questions wrong. Each time a student gets an item incorrect, he or she will be presented with a simpler question until the diagnostic finds the grade level at which the student is performing. The assessment efficiently assesses students across multiple grade levels, allowing for identification of root causes of students’ struggles or for identification of areas where a student is ready for further challenge. This information will then provide the teacher with a “road map” to instructional remediation. Once your child completes the test, he or she will be assigned online instruction to support his or her progress in mastering each skill. The online instruction is designed to be both challenging and engaging. i-Ready delivers instruction using engaging, contemporary animation; the lessons are also interactive. The result is an experience that attracts and holds your child’s interest while also teaching important skills and concepts. These lessons are proven to help students grow academically. In addition, i-Ready Diagnostic & Instruction supports the teachers and administrators at your child’s school. The program provides a series of comprehensive reports designed to make classroom instruction more effective. These reports include data about student performance as well as detailed teaching suggestions. They help educators make informed decisions about the instruction that is right for your child. Should you have further questions, please do not hesitate to contact your child’s teacher. Why are some questions so hard? To enable a precise assessment, i-Ready Diagnostic is designed so that students will answer about 50% of the questions incorrectly. We need to understand what’s too easy, what’s too hard, and what’s just right. Why isn’t there an “I don’t know” option? It is critical for the test design that the student answers the question correctly or incorrectly so that the test can adapt to an easier or more difficult question. For example, when students have an "I don't know" choice and they lack confidence, they are likely to select "I don't know" even when they may know the answer. It is better if they make an educated guess, as that provides a much more accurate estimate of a student's ability than giving them the option of "I don't know." Should I help my child during the test? You may help your child with any technical issues, such as adjusting your computer’s speakers, but it is important that your child completes the test independently to the best of his or her ability so that we can get an accurate read and deliver instruction at his or her unique level. Is i-Ready Diagnostic a timed test? No, encourage your child to take his or her time on the test. It may be helpful to take the test over two sessions. For more information on i-Ready Diagnostic & Instruction, please visit the Curriculum Associates website at www.CurriculumAssociates.com. 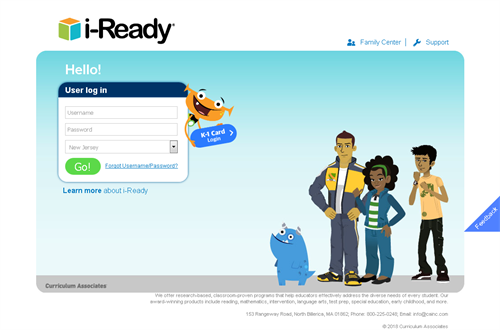 Students can access i-Ready from any computer by going to https://login.i-ready.com/. Students log in using their classroom code and individual set of symbols. Please contact your child's teacher for this information.